March 25, 2008 June 21, 2013 ~ Martha B. An unused, rusty mailbox becomes a storage box to stash tools in. Vintage tool ( hammers, nails, etc.) carriers are hard to find now but they’re great for toting garden tools around. An impromptu desk in a potting shed holds tools on the wall. Note they’ve been outlined for easy storage. 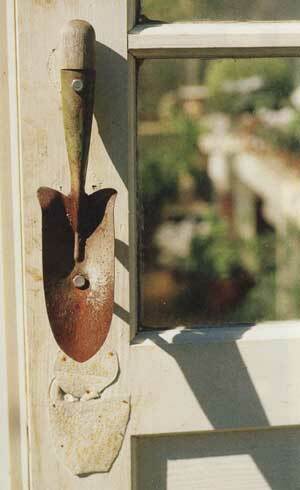 A garden tool can be a fun door handle to a shed or greenhouse. This idea takes a metal topiary frame and suspends it from the ceiling. Garden tools hang from it like a chandelier. Love this. I just adore great garden tools. They look so pretty in a display!